This week, I have a special guest column from Eric of FantasyLoot.com, who will discuss who to select and who to avoid in your daily fantasy lineups. Check out his recommendations below to see how he did! Last week was one of my more successful weeks for this column. The five players I recommended buying combined for 99.92 points on FanDuel, good for just under 20 points per player. The 3 players I recommended to stay away from combined for just 36.48 points, good for just over 12 points per player. Since we only discuss players valued over $8,000, you really need to get at least around 20 points out of these players to have a chance of winning anything. Getting just 12 points out of a guy you spend good money on is a recipe for disaster. With that said, here’s the players I love and hate over $8,000 this week on FanDuel. 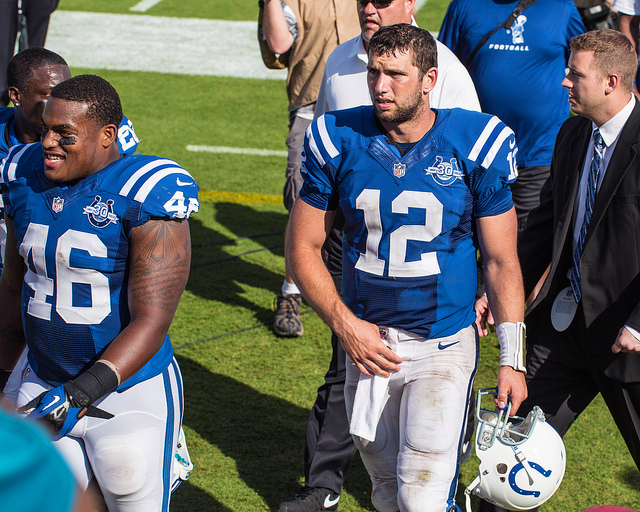 Andrew Luck: $9,900 – 39… The fewest pass attempts Luck has had in his last 5 games. 312… The fewest passing yards Luck has had in his past 5 games. Luck is on fire and he’s worth every penny. I see him having no problems against the Steelers in Week 8 and reaching at least 25 fantasy points. Marshawn Lynch: $8,500 – Lynch hasn’t been very good in his last two games. The Seahawks haven’t either. Coincidence? I think so! I fully expect the Seahawks to get back to getting Lynch the ball and dominating the pace of the game. Lynch should have a “beast mode” worthy game this week and he’s a steal at this price. I like him as much or better than all of the top tier running backs this week and there are five RB’s priced higher than him. Jordy Nelson: $8,800 – Nelson has been outstanding this year. His only downside is the Packers getting a big lead and not throwing the ball very much down the stretch. Luckily, by that time he usually already has at least 80 yards and a touchdown. He’s the one receiver that can literally go for 30 just about any week. New Orleans will have trouble keeping Nelson covered up. Dez Bryant: $8,800 – Dez was a monster in the second half last week. He’s in line to shine in a divisional game on Monday night this week. Tony Romo and Dez have great chemistry and I fully expect them to hook up for at least one touchdown this week. He should also close in on 100 yards pretty easily. For what it’s worth, I really like Romo this week as well. Russell Wilson: $8,900 – He’s been exceptional in two of his last three games. The problem is, the Seahawks haven’t been very good. Seattle is at their best when Russell Wilson is making plays, but not being the sole focus of the offense. I think they give the ball to Lynch a lot this week. That being said, I do expect Wilson to play good football, I just don’t think he’s going to rack up the fantasy points. Andy Dalton: $8,000 – Dalton is right on the cutoff line for this column at this price. However, I wouldn’t touch him. There are guys who will score just as many fantasy points, if not more, that are priced $500 to $1000 less than Dalton. Your money will be better spent elsewhere. Giovanni Bernard: $8,600 – Bernard had a really bad outing last week. Going up against Baltimore, I’m a little worried about him this week as well. For the sake of my standard league fantasy teams, I hope this prediction is wrong. However, he’s been limited in practice this week with a rib injury and while I expect he’ll play, if his ribs are hurting, the Bengals have a serviceable backup in Jeremy Hill to give some of his carries too. That’s it for this week. There are only 6 receivers priced over $8,000 this week and I don’t hate any of them, which is why there aren’t any included in this week’s list. Best of luck in Week 8! Want to see how you can construct a team with these plays? You can find my personal lineup for this week’s Fanduel 50/50 leagues here. Eric is the owner of FantasyLoot.com. You can connect with him on Twitter at @FantasyLoot, or on Facebook to see all his advice for your daily fantasy football lineup.